As told in the “The Dunce At The Back Of The Class”, William was an unwanted child. 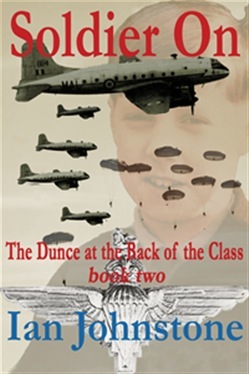 He was mistreated, beaten, mentally abused by his father, his brother and by his teachers, and yet he fought back – not physically, but with a sold determination to succeed that led to him joining the Parachute Regiment and, against all odds, passing through the training to take his place among the elite Special Forces.This second book tells of his time as a soldier, his postings to trouble spots and on manoeuvres, sometimes hilariously funny and at other times troubled and poignant. It also tells of his life after the Army, of those who helped him and those whose only agenda seemed to be to try to make his life a misery. It tells of his marriages and his children, and finally it tells of the passing of his only true love. Acquista Soldier On in Epub: dopo aver letto l’ebook Soldier On di Ian Johnstone ti invitiamo a lasciarci una Recensione qui sotto: sarà utile agli utenti che non abbiano ancora letto questo libro e che vogliano avere delle opinioni altrui. L’opinione su di un libro è molto soggettiva e per questo leggere eventuali recensioni negative non ci dovrà frenare dall’acquisto, anzi dovrà spingerci ad acquistare il libro in fretta per poter dire la nostra ed eventualmente smentire quanto commentato da altri, contribuendo ad arricchire più possibile i commenti e dare sempre più spunti di confronto al pubblico online.